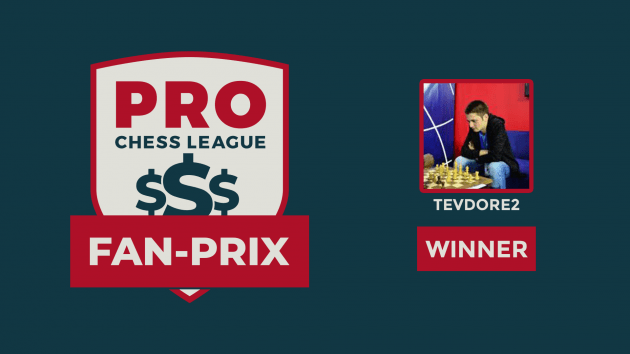 Congrats to @tevdore2 for scoring a total of 276 points in the PRO Chess League Fan-Prix series. He finished with the highest score in the series and wins a 3-year membership for his fantastic performance. He was closely chased by @MovingDutchMan who was only 8 points behind. The Fan-Prix series was run on Wednesdays (mostly) during PRO Chess League league off days so that fans could participate and enjoy their own battles in rapid chess. Each of the 10 individual tournaments was played at the 10+2 time control in a two-hour arena format. The largest tournament collected an impressive 657 players. All tournaments were streamed by @Gothamchess and @Bikfoot on twitch.tv/prochessleague.